"Aut disce aut discede" Anon. When did the unfinished cycle route take over the title of 'Bridge to nowhere'? That's the Charing Cross bridge, whether or not it has subsequently been built on. I'd put that into the same category as the Subway being referred to as the 'Clockwork Orange'. Josef wrote: When did the unfinished cycle route take over the title of 'Bridge to nowhere'? It's a colloquialism. The 'Charing Cross Podium' is the official title of the first bridge. It's in a similar vein to the Stobcross Crane being called the Finnieston Crane. Not disagreeing with that for one second. I was just pointing out that it's still called that, and I've never heard the term used to refer to the cycle path. I don't think any sort of urban cycle route network as we know it now was in mind when the bridge, the one behind the flats behind what was the the Buttery was started but not completed. When the possibility of Sustrans dosh came along the Bridge to Nowhere tag was a good marketing ploy for Glasgow's bid for the money. It's always been known locally as the Bridge to Nowhere and it became a point of local particularly when the Margaret Blackwood Housing Association opened their flats, designed and adapted to suit wheelchair users, on Argyle St between the TSB building and the Buttery. Don't forget the other bridge sandwiched between 2 buildings. They finally popped a building on top of it. I thought the bridge with the building on top of it was the Charing Cross one. The "Bridge to Nowhere"(TM) is nearer Anderston, shurely? "-What was all that then? - What? - THAT. - That was Glasgow"
The 'Bridge to Nowhere ' is just north of Anderston train station and crosses North St en route towards Waterloo St passing over the carpark at the Marriott(?) Hotel in Argyle St. The one at Waterloo Street is always crawling with smackheads. Tried to take a few photos one Sunday morning. Was particular nervous doing so. They all seem to be coming out of the shops (well it looks like shops) area. Great photos. This bridge always facinated me. Amazing it'll be finished after over 40 years! Much effort has gone into designing the route. We are now in the final stages. Phase 2A M8 bridge - Started August 2012 - complete March 2013! 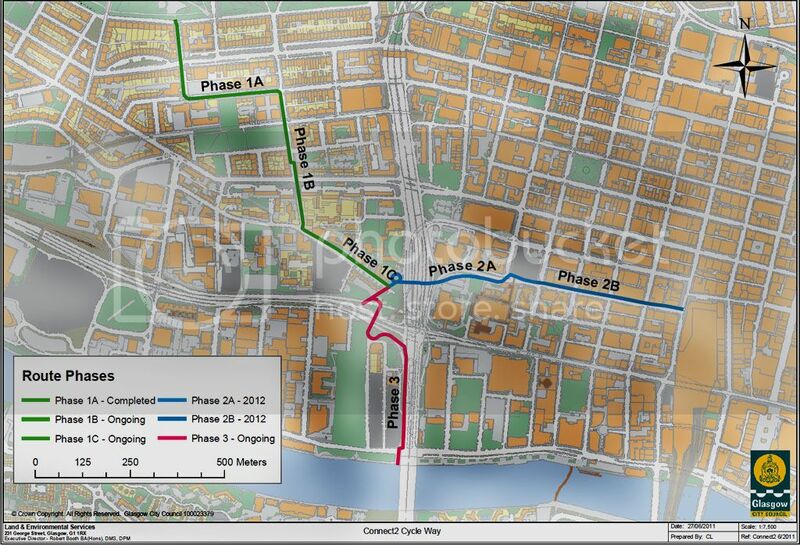 Phase 2B Waterloo St. to Central Station - complete March 2013! Phase 3A Clydeside Expressway Bridge - complete March 2013! bAzTNM wrote: The one at Waterloo Street is always crawling with smackheads. Tried to take a few photos one Sunday morning. Was particular nervous doing so. They all seem to be coming out of the shops (well it looks like shops) area. Do you ever get out around the city without seeing raving loonies, junkies, hermits or crazy Chinese triad types? You could write for the Daily Mail.